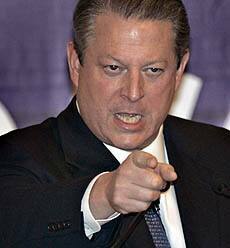 Gore looks like a lunatic. Here is a guy who uses more energy than any one man should be allowed to use, telling people how to live. Gore and Suzuki are fanatics and they are both dangerous. Suzuki gets the NHL to endorse the carbon credit scheme and then Gore uses references to the NHL to call down Canada. The tag team of Gore and Suzuki, with the sheep cheering in the background, take on the world. Al and David seem to take great pleasure in scaring children, telling them the world is going to end. The worst part of this whole thing is the way the media panders to them. Maybe the time has come to order a mental assessment of these two fanatics. If I had young children I would be spitting sparks. If you don’t speak up your children will be paying carbon tax on everything the rest of their lives. Gore has already made fifty million off this scam. It’s not about global warming. It’s about the money. Gore needs all the countries to join to make his carbon credit scam really take off. Who the hell do Gore and Suzuki think they are, demanding that you, I or Canada do as they say. These guys are certifiable. In language suited to the ears of Canadians, former U.S. vice-president Al Gore quoted the wisdom of a hockey legend on Thursday at a summit in Bali, apparently criticizing Canada’s stance on climate change during UN talks on the issue. Nobel Peace Prize winner Al Gore addresses the UN climate change conference Thursday in Bali, Indonesia. Although he never named Canada directly, Gore’s hockey-referencing address to the 190-nation summit hinted that he was pointing a finger at Canada for blocking a climate-change framework that includes hard targets. That document would set binding targets of a 25 to 40 per cent reduction for industrialized nations by 2020. Aside from Canada, the U.S., Japan, New Zealand and Russia also oppose such language for the emissions limits. This entry was posted on December 13, 2007 at 5:49 pm and is filed under Al Gore, Al Gore Lies, bali, CBC, CBC news, child abusers, climate change, David Suzuki, Gore and Suzuki, Grestky, hockey, NHL, Suzuki, United Nations. You can follow any responses to this entry through the RSS 2.0 feed. You can leave a response, or trackback from your own site.